PAPAGO! is excited to run our very first ever video contest! Are you passionate about your dashcam footage? So are we and we want you to create an amazing video telling a story of your choosing. 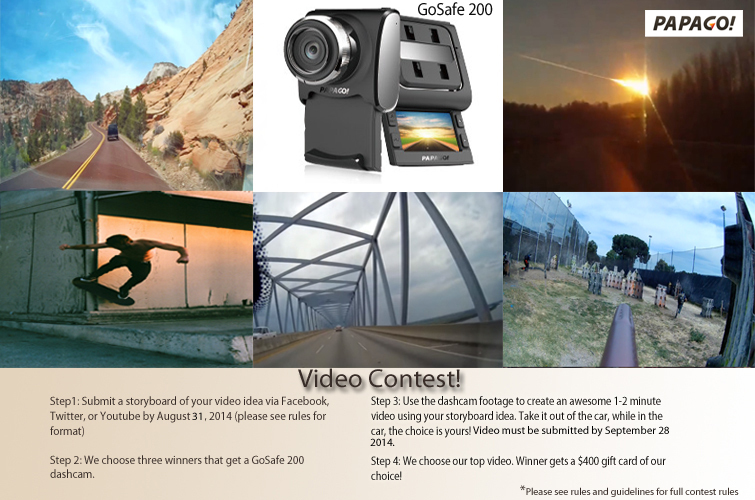 3 winners will receive a GoSafe 200 dashcam and one ultimate prize winner will win a $400 gift card of our choice! PAPAGO! is pleased to announce that they will feature the newest editions to the GoSafe line at the COMPUTEX Taipei 2014 this year. The newest GoSafe dashcams are both incredibly different. Each covers specific creative technological qualities for consumers with specific needs in mind. The stealth design of the GoSafe 200 is like nothing else on the market today with its’ ability to clip on your rearview mirror and a hideaway LCD screen. While the GoSafe 260 replaces your rearview mirror and records footage with a crisp, clear quality that overshadows all the similar products of its’ kind. COMPUTEX Taipei is best known as the host to the top innovators and tech greats from around the world, so PAPAGO! will fit right in. You can find PAPAGO! in the Taipei World Trade Center, Exhibition Hall 1, 1F Booth #D0611a. COMPUTEX Taipei 2014 will be held at the Taipei International Convention Center from June 3-7. Starting June 6, 2014 the latest PAPAGO! GoSafe dashcams will be available for purchase in the US and Canada at select retailers. Please visit us.papagoinc.com for the latest retailers available. If you are interested in becoming a distributor please contact sales_us@papagoinc.com.